Borrelli Walsh USRC Tigers pushed undefeated Societe Generale Valley to the brink in this evening’s KPMG Top 4 Premiership Game of the Week at Happy Valley, scoring inside the final five minutes before eventually losing 15-10. 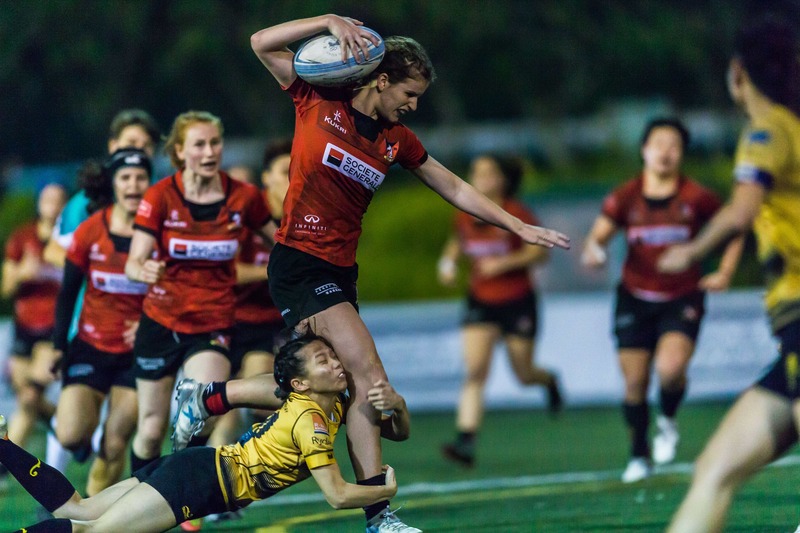 In other Top 4 action, Gai Wu Falcons beat Kerry Hotel Kowloon 59-10 as last season’s league champions remain on track to defend their league title against Valley. In the minor Premiership, Natixis HKFC Ice beat Plastic Free Seas City Sparkle 19-3 to keep a firm grip on first place ahead of challengers SCAA First Pacific Causeway Bay, who edged Transact24 Taipo Dragoons 17-0, to stick close to table-toppers Ice. A brave performance against Valley was heartening for Tigers, who suffered a significant blow earlier in the week with their 20-7 loss to Gai Wu made worse by season-ending injuries to Natasha Olson-Thorne and Lara Schats. Absent key cogs like Olson-Thorne, and fielding only 20 players against a dominant Valley side, Tigers fought bravely in the losing effort. Valley opened the scoring after just three minutes when centre Kelsie Bouttle crashed over the line for the opening try with player-coach Bella Milo adding a perfectly slotted penalty in the 24th minute to extend the lead to 8-0. Flanker Winnie Siu helped drag the Tigers back into contention with a crucial try shortly before half-time, giving USRC some crucial momentum going into the break with Valley’s lead cut to just three at 8-5. The second half started much like the first with Valley jumping ahead after another early score, this time from prop Jasmine Cheung whose try came after just six minutes of play. Milo’s conversion put Valley ahead 15-5 and set the stage for a climactic 30 minutes of end-to-end action as both sides threw everything into the attack. Maelle Picut, one of the crop of Hong Kong age grade players making an outsize impact for Tigers at Premiership level, provided the dramatic finish with a try in the 77th minute to close the gap to five points with three minutes left on the clock as Tigers trailed 15-10. The conversion was off target and Tigers would fail to make another visit to Valley’s red zone as the league leaders smartly held onto possession as time expired. It was a case of close but not close enough for Tigers, who now slip into third place in the Premiership with no mathematical possibility of closing the gap, leaving the fight for the league title to another traditional battle between Valley and Gai Wu. The 15-10 win represents Valley’s smallest winning margin of the season. All three of Valley’s narrowest escapes have come against Tigers this year, including an eight-point win on the opening weekend of the season and a seven-point victory in January. With Tigers coach Fan Shun-kei expecting to meet Gai Wu in the Grand Championship semi-finals, and having seen his side steadily chip away at Valley’s leads, his strategy to position for a run at post-season silverware in the Grand Championships could prove prophetic. Valley’s win extends their perfect record to 11 matches this season, including four in a row in the Top 4, good for 17 points on the table, with Gai Wu just three points off the pace after their bonus point win over Kowloon. The two sides will meet on the last weekend of the Premiership season in what promises to be another riveting encounter ahead of the kick-off of the Grand Championships. Tonight’s loss sees Tigers slip to third place on the table with 7 points, ahead of winless Kowloon. Today’s minor premiership results see the battle continue to rage between Natixis HKFC and Causeway Bay for the KPMG Premiership A title. Club’s win over Causeway Bay two weeks ago is enough at present to keep them in first place, with a single point advantage over Causeway Bay (14 points to 13). The two sides will also face off on the last weekend of the Premiership season on 23 February. After contending in the top three for most of the minor Premiership, today’s loss sets Taipo further adrift on the table as they lie in third place on five points ahead of City Sparkle on no points.